Back in 2008, as part of the Centenary of League celebrations, the ARL brought together a panel of 130 experts and selected their Team of the Century. Including the eight immortals of the game (although oddly with two on the bench), the Team was almost universally acclaimed and showcased the incredible talent in the game over its first 100 years. Nearly a decade on, we are (maybe? surely?) 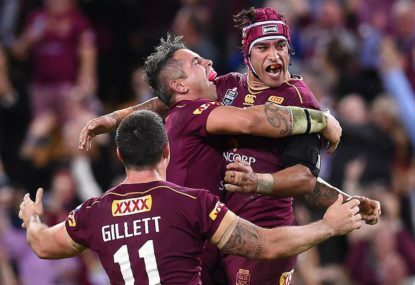 coming to the end of an unprecedented period of success for Queensland in State of Origin. In addition, the NRL has defied shoulder charge bans, bunkers, slaps, blockers and even Cronulla winning a premiership to continue bringing superior athleticism to the toughest game on the planet. Many players during this past ten years have been trumpeted as freaks of nature and future immortals. Given we will all be dead and gone before the Team of the Bicentenary is announced, let’s have a look at the early front runners and see if any of them would have a case to knock off the current greats of the game. A tough one to start with. Clive Churchill was one of the original Immortals. The ‘Little Master’ won five premierships with Souths and played 37 Tests for Australia. He changed the role of the fullback with his attacking prowess and reading of the game. ‘Billy the Kid’ is widely considered the best since Churchill and there has been a serious conversation that he has become the best fullback of all time. A fixture during Queensland’s record-breaking run, he has also been an integral part of the Melbourne Storm’s Big 3. He has played over 300 games and scored 177 tries for the Storm as well as playing 25 Tests for Australia. Verdict: I never saw Clive Churchill play but in his era he was undisputedly the best player in the game. I’ll stick with the ‘Little Master’. While wing play has changed tremendously over the years and the amazing leaping tries in the corner are now commonplace, I can’t think of a single winger in the last decade to come close to these two. Bevan crossed for 757 tries in English club football when the standard was as good or better than the Australian game. 757 tries, that’s no typo. Ken Irvine was arguably the fastest player to play the game, once clocking 9.3 seconds over 100 yards and he still holds the try-scoring record for the Australian Rugby League at 212, as well as a combined 63 tries for Australia and NSW. Verdict: Bevan and Irvine have no peers. Reg Gasnier was the Prince of Centres and an original immortal. Often considered the most naturally gifted player to have played the game, Gasnier had blinding acceleration and a brilliant swerve. He was instrumental in St George’s run of 11 premierships during the 1950s and 60s. He is a lock for this side. Big Mal is the only player to have gone on four Kangaroo Tours and he captained the last two. He played 46 Tests for Australia and 32 State of Origins for Queensland during their first dominant period. A truly terrifying spectacle in full flight, he also could knock goals over as one the of last of the toe poke style of kickers. Mal was an integral part of the Canberra Green Machine, which became one of the greatest club combinations of all time. But then there is Greg Inglis. Inglis became Queensland’s southern-most superstar at a young age and has swept all before him ever since. GI was a champion centre for Melbourne but also won the Clive Churchill medal for best on ground in a grand final at five-eighth. He started for Queensland as a great winger and has dominated at full back as part of the team that broke Souths’ great grand final drought. With 31 tries from 38 Tests for Australia and a highlights reel to die for, there is an argument that Inglis could knock Big Mal from his perch. Verdict: Greg Inglis is Mal Meninga 2.0 and takes the spot. The King was made an immortal in 1999 after an amazing representative career. From the very first game in 1980 Lewis was State of Origin. His long passing and vision revolutionised the game and his eight man of the match awards in State of Origin remain a record that is unlikely to be broken. Lewis played 34 Test matches, 24 as captain, including leading the 1986 undefeated Kangaroo Tour. If Lewis was the King, then Lockyer became the Prince. The only player to win the Golden Boot for the world’s best player in two different positions, the Champion fullback became a superb five-eighth and captain. Legendary for his ability to pull out the clutch play when required, Lockyer holds the record for most Tests, most games as captain and most tries for Australia. Under his leadership in 2006 Queensland started their State of Origin dynasty. Lockyer also won four premierships with the Brisbane Broncos. Verdict: So very close, but I’d have to take The King. Andrew Johns changed the game of rugby league with his unprecented kicking in general play. He won two premierships with a Newcastle team that he dragged over the line through sheer talent and force of will. The complete player, Johns held the NRL point-scoring record of 2176 at the time of his retirement. 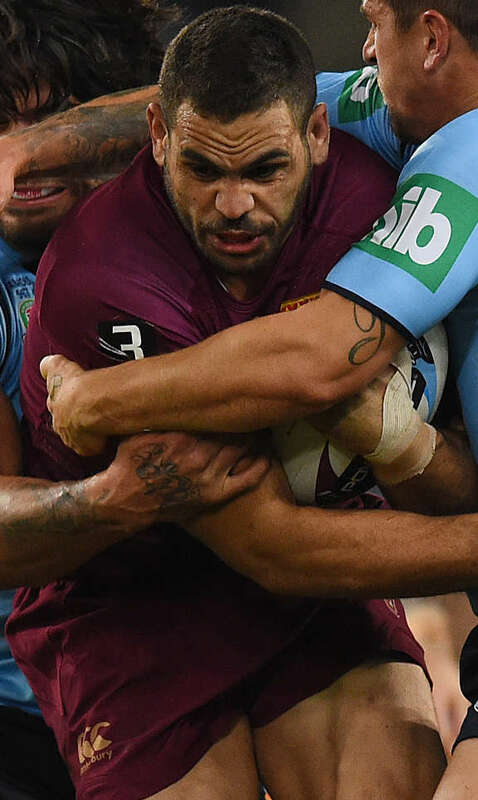 JT played 36 consecutive State of Origin Matches and has been the common factor for the entire Queensland reign of terror. JT has been blessed with a devastating ‘show and go’, a superb kicking and running game and an iron will. In 2015 he led North Queensland to a premiership to round out his resume. And he holds the record for most points for Australia. Verdict: JT by a whisker. So, Greg Inglis and Johnathan Thurston take spots from two greats of the game in Mal Meninga and Andrew Johns. Next, the forwards and the bench.